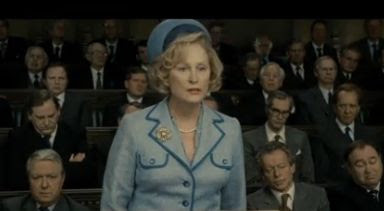 While Meryl Streep's role in the film "The Iron Lady" has drawn criticism from Baroness Thatcher's former colleagues, including former Conservative party chairman Lord Tebbit, Meryl Streep has defended her portrayal of former Prime Minister Margaret Thatcher as a frail old woman suffering from dementia. As for the film, it in a series of flashbacks sees an elderly Baroness Thatcher struggling with advanced dementia and in regular conversation with her late husband Denis Thatcher, played by Jim Broadbent. The rest of the film deals with her rise and eventual fall from power, and features scenes of her bullying her cabinet into submission.